What is Urban Stitch Studios about? Kids and Sewing! Sewing is a rewarding way for children to express their desire to create. It is a valuable and artistic skill that can last a lifetime. 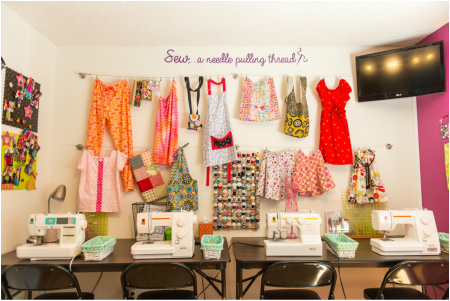 Urban Stitch Studios is a home sewing studio dedicated to teaching children ages 6-16 to sew. The studio is appointed with high quality machines and all the equipment necessary for classes, i.e. new Baby Lock sewing machines, cutting table, ironing station, scissors, rotary cutters, rulers, markers, templates, pins, needles, etc. Parents only need to supply fabric, thread and notions (buttons, zippers, elastic, etc.) as needed for each project. Classes are small, with four students maximum, allowing for plenty of individual instruction. This is important because in addition to the Kids Can Sew™ curriculum students soon advance into using Urban Stitch Studios designed and hundreds of commercial patterns. This is where instruction becomes very individualized; as students are offered a myriad of project ideas suited to their new skill set and are able to make their own selection of pattern as well as customize each project. When entering the studio children are welcomed and appreciated for their unique personality and qualities. There are no mistakes, only opportunities to learn. The classroom environment is cheerful and encouraging, thus providing a positive experience for each child. With encouragement to make their own choices children see their ideas become reality and take pride in their accomplishments. 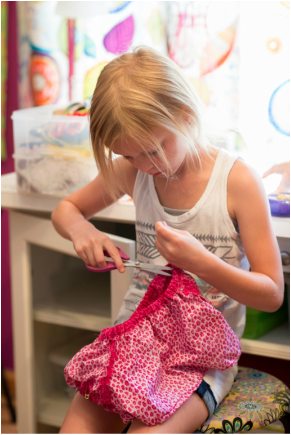 They will learn patience, focus, and discipline while creating their own clothing and other fun sewing projects. Learning to sew develops confidence in abilities, which will be expressed in all areas of their lives. It is my desire to teach the art and craft of sewing to children and teens, while making sure that all of us are having fun! If this experience is something you want for your child, please contact me to register for classes.